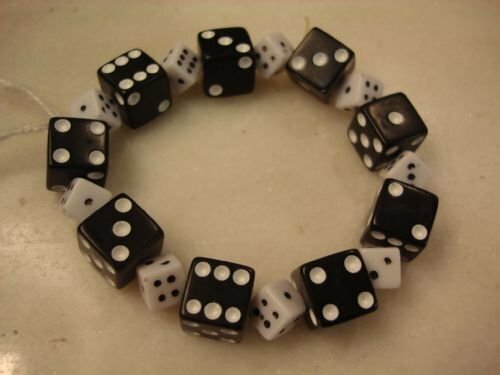 Vintage 1940's French dice necklace. 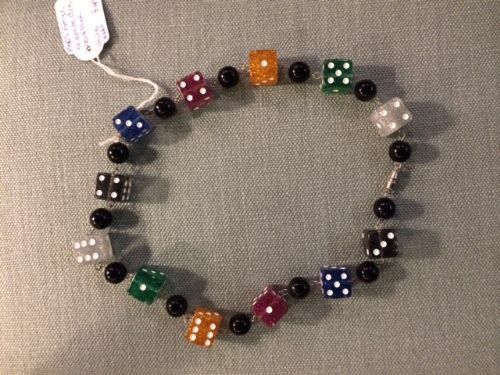 An unusual 1940's vintage French multi-coloured dice necklace with black bead spacers. 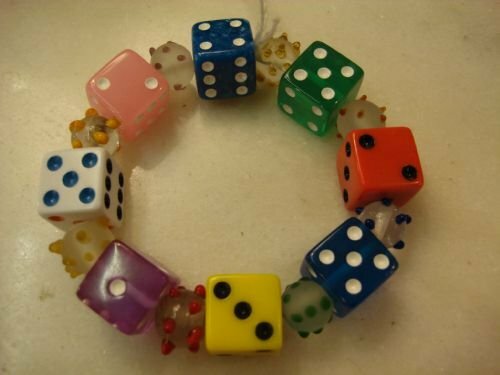 The dice were part of an unopened warehouse shipment from that era, and fashioned into unique vintage jewellery. A stylish piece and an excellent talking point, in very good condition. 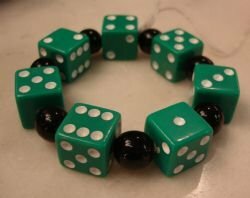 See our good selection of unique gaming jewellery comprising earrings, necklaces and bracelets made from mah jong tiles, dominoes, and dice. An unusual vintage clear dice necklace with black bead spacers. 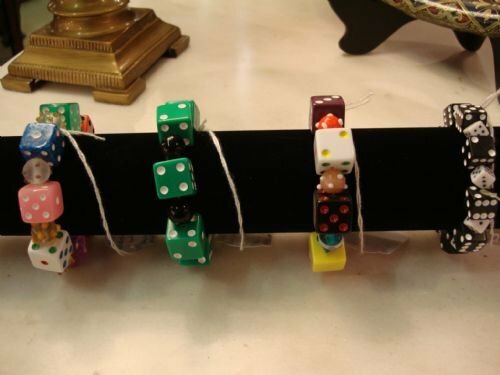 These vintage dice were fashioned into unique eye catching jewellery. Wonderful vintage domino tile bracelet with traditional Bakelite/marbelite black and white tiles separated by white glass beads, strung on elasticated bands to fit all sizes. A very quirky bracelet for the gaming enthusiast or an accessory for the vintage clothing aficionado. Tile size-1 7/8 inches long by 7/8 inches wide. 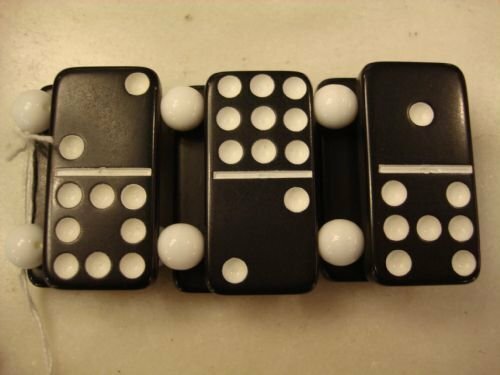 Please see our collection of vintage gaming jewellery made from mah jong, dice and domino pieces, and including necklaces, earrings and bracelets. 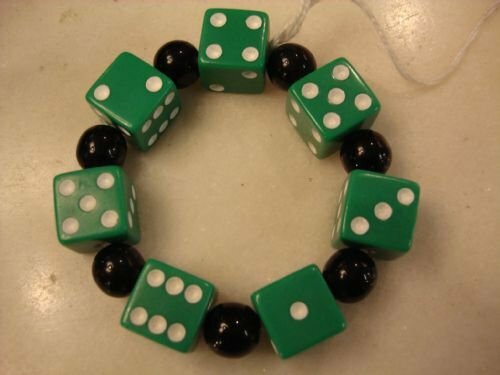 1940's French Bakelite dice bracelet. 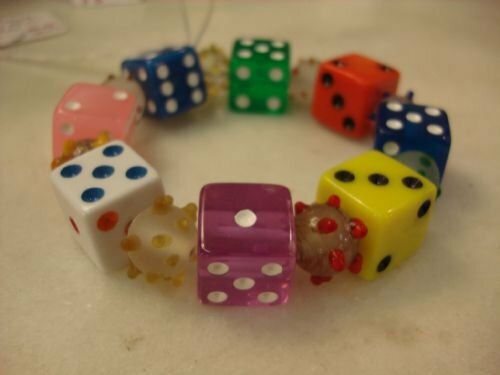 Made from French Bakelite dice, found in a warehouse abandoned in the 1940's, a lovely elasticated bracelet with the dice separated by bumpy glass beads. The last photo shows the selection available, and listed separately. In very good condition, this is a great bracelet for the gaming enthusiast as well as an accessory for those who wear vintage clothing. 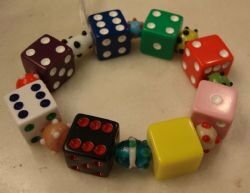 A quirky piece of jewellery for anyone. Please ask about our collection of gaming jewellery made from mah jong, dice and domino pieces, and including necklaces, earrings and bracelets. Not all pieces are shown online. 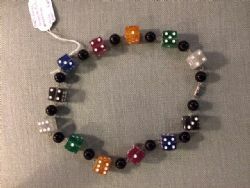 Made from French Bakelite dice, found in a warehouse abandoned in the 1940's, a lovely elasticated bracelet with the dice separated by black glass beads. Vintage French Bakelite dice bracelet. Made from French Bakelite dice, found in a warehouse abandoned in the 1940's, a lovely elasticated bracelet with the dice separated by mini dice beads. 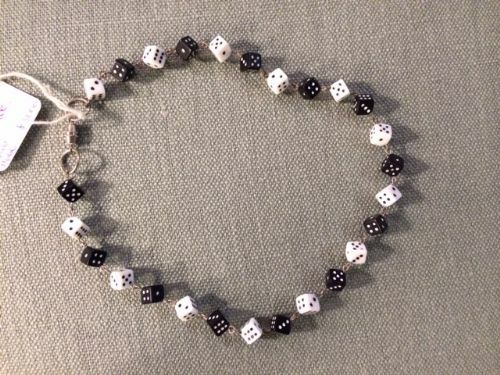 Vintage black and white mini dice necklace. 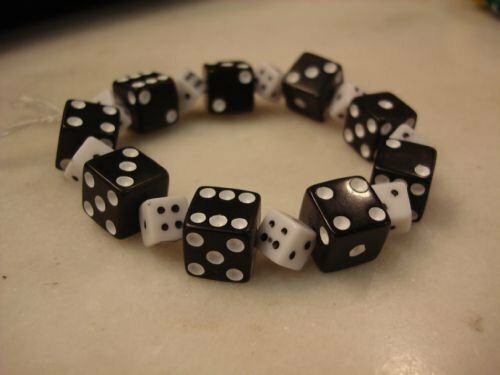 An unusual vintage mini black and white dice necklace. 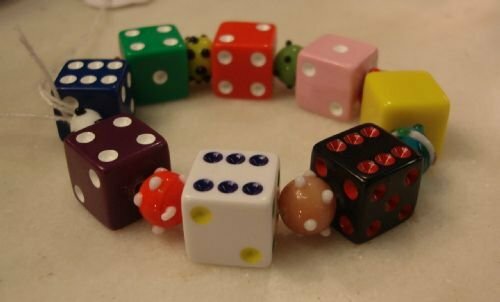 These mini dice were fashioned into unique vintage jewellery. 19thC superb large Victorian amethyst and diamond bar brooch in gold setting. 19th century superb Victorian unusual large amethyst and diamond bar brooch, set in gold, and contained in the original case. The long gold bar splits to centre around a central amethyst mounted within 12 prongs, and held by two arms on each side, in which are set four rose cut diamonds between within a recessed gilded design. Size of brooch is 3.25 inches long, with the diameter of the amethyst being 5/8 inches and 3/8 inches deep. The approximate carat count for the amethyst is 8-10 carats, a very large stone. 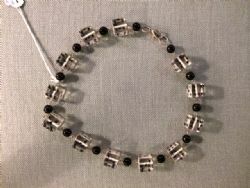 The brooch closes with a "c" pin clasp to back, and there is also an attached safety chain with pin as shown. This was retailed by Munsey and Co. Ltd. of Cambridge, and is enclosed in the original blue domed case, which still retains a nice tight hinge and closure. It is a lovely rare brooch of impressive size, with great style, found in the original fitted case, and in very good condition. Chester 1895 Victorian stunning 9 ct yellow gold antique set of cufflinks and formal dress studs in the original case, made by Abraham Meyer Blanckensee. Chester 1895 Victorian English hallmarked solid yellow gold 9 ct. gentleman's formal dress set of studs and cufflinks made by Abraham Meyer Blanckensee, and contained in the original fitted case. The set was retailed by jewellers Cufflin of London and Westow Hill, and bears their label inside the case. It comprises a pair of oval two sided cufflinks, with 1 larger and 3 smaller matching dress studs, as well as two paste set studs, in the original stunning fitted leather case. 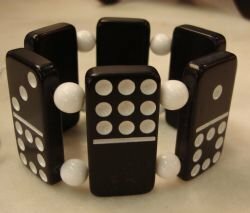 Size of cufflinks-.75 inches long by 5/8 inches wide. The four studs and cuff links are profusely all over engraved with leafy decoration, and bear full matching hallmarks. Largest stud has small crimp to stem, which is hidden when worn. A lovely striking and unusual set in very good condition, assayed in Chester, also a very collectable hallmark. A fabulous antique present for a gentleman, from the age of elegance.